In 1878, C.F.W. Walther began a series of lectures to the students of Concordia Seminary on thirteen theses about Law and Gospel. Because of the popularity of the presentation, Walther presented a second, expanded, lecture series in 1884–85 on twenty-five theses. In 1929, the notes of the second lecture series were printed in translation by W.H.T. 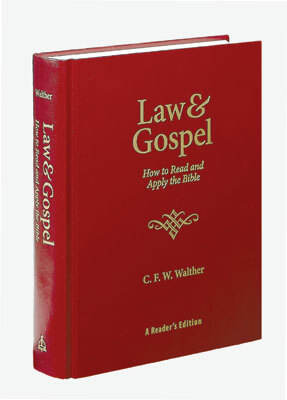 Dau as the classic The Proper Distinction Between Law and Gospel, which has remained the most popular of Walther’s writings and a powerful witness to the biblical and confessional stance of the founder of the LCMS. The following excerpt is taken from the reader’s edition of Law and Gospel: How to Read and Apply the Bible (trans. Christian C. Tiews, ed. Charles P. Schaum). Footnotes have been omitted. It is a glorious and marvelous arrangement—one that surpasses all understanding— that God governs the kingdoms of this world, not by immediate action but through the agency of human beings who, in addition to all their other shortcomings, are far too short-sighted and far too feeble for this task. As such, it is all the more marvelous that even in His kingdom of grace, God plants, manages, extends, and sustains His kingdom not directly, but by means of men who are altogether unfit for this task. This is proof of God’s loving-kindness, love for humanity, and wisdom, which no human intellect can understand. For who can measure the greatness of God’s love, revealed in the fact that He desires not only to save this apostate world but also even to employ human beings—that is, sinners—for this task? Who can plumb the depths of the wisdom of God, who knows how to accomplish the work of saving people by—of all things—using other people who are quite unfit and unqualified for this work? And who can understand that He has previously gloriously pursued, and still is pursuing, this work? My dear friends, what a huge thing—not only to marvel but also to rejoice in the fact that God wants to use also you as tools of His grace. Just stop and consider: if at this place you could learn how to prolong the life of those entrusted to your care by fifty years, or even to raise the dead to a new lease on life, how great and glorious your calling would appear—not only to you but also to all people! Imagine in what great demand you would be and how you would be honored as extraordinary men! What a treasure people would think you are! And yet all of that would be as nothing compared with the exaltation and glory of the calling for which you are to be trained here. Your job is not to prolong this poor, earthly life of those entrusted to your care, but to bring to them the life that is the sum of all bliss, the life eternal, without end. Your job is not to raise those entrusted to your care from earthly death to live once more in this poor earthly life, but to pluck them out of their spiritual and eternal death and usher them into heaven. Oh, if you would seriously consider what a great honor God means to confer on you, you would get down on your knees every day, every hour; you would prostrate yourselves in the dust and exclaim with the psalmist: “O Lord, what is man that You regard him, or the son of man that You think of him?” (Psalm 144:3). At the same time, you would have an incentive to surrender yourselves to our merciful God every day and every hour, saying, “Lord, here I am with my body and soul and all my strength. I am willing to apply myself fully in Your service.” How gladly you would be prepared to make every sacrifice in the interest of your calling and allow yourselves to be fashioned into tools of God! However, the matter of utmost importance for you is that, before you teach others, you first obtain a very thorough and vital knowledge for yourselves of the things that God by His prophets and apostles has revealed for the salvation of men. Let us, then, cheerfully proceed as we consider our highly important subject. To begin with, let me submit two testimonies from Johann Gerhard. To be fair, he cannot claim the same depth of experience with the same divine rhetoric that was granted only to Luther. However, Gerhard did study Luther thoroughly, and he gave a systematic presentation of Luther’s teaching. In Topic 14 regarding the Gospel, paragraph 55, Gerhard says, “The distinction between Law and Gospel is to be maintained everywhere.” Note well: at every point. There is not a single doctrine that does not also call upon us to rightly distinguish Law and Gospel. Gerhard continues: “This distinction must be observed in two areas: First, in the article of justification, since we are not justified by the Law because of the corruption and weakness of our flesh, which is certainly, though accidentally, incapacitated for this task. See Romans 8:3.” The Law does not belong to the doctrine of justification. That is a most important point! We cannot be saved by the Law. Accordingly, God provides another means for us by which we can be saved. Everything hinges on whether or not we accept this joyful message—the Gospel. If you remove from the Bible the doctrine of justification, Scripture would sink to the level of any other book of morals. “But now the righteousness of God has been manifested apart from the law” (Romans 3:21)—it is revealed in the Gospel, “for it is the power of God for salvation to everyone who believes” (Romans 1:16). For this reason men should be exhorted, even urged, to perform good works according to the norm of the Law. These works, however, must not be brought into the most high sanctuary where our justification in the sight of God occurs. For at that point there is ceaseless conflict between doing and believing, between grace and works, between Law and Gospel. Woe to us if we proclaim the Gospel and mingle the Law with it! But that is exactly what we are doing when we proclaim the Gospel and go beyond simply saying, “Accept this message!” That would be twisting it into Law. The Gospel demands nothing of us; it says only, “Come, eat and drink.” What the Gospel offers to us is the Lord’s Supper. Here is where most preachers make their mistake. They are afraid that by preaching the Gospel too clearly, it will be their fault if people lapse into sin. They imagine that the Gospel is food for the carnal-minded. True enough, to many the Gospel does become the smell of death unto death, but that is not the fault of the Gospel. That happens only because men do not accept—do not believe—the Gospel. Faith is not merely thinking, “I believe.” Your whole heart must be seized by the Gospel and come to rest in it. When that happens, you are transformed and cannot help but love and serve God. The main thing to tell a person when you explain how to become righteous is to announce to him the free grace of God, concealing nothing, saying none other than what God says in the Gospel. Build a fence around Mount Sinai, but not around Golgotha, because at Golgotha all God’s wrath was appeased. Now, the Lord has given two “keys” to the Church—and via the Church to all preachers as well: the key for binding and the key for loosing. The key for binding locks heaven; the key for loosing opens it. The preacher holds in his hand these two wonderful keys, for the Church bestows them on him when it confers on him the Office of the Ministry. If I know that a person is not in a condition to have the Gospel preached to him, I must not proclaim it to that person. However, when I speak in public, the situation is different. There I must take into consideration chiefly the elect children of God. Still, I must preach the Law even there. In fact, a sermon that does not contain any Law is worthless. In every gathering of people there are always some impenitent persons who must be shocked out of their sleep of sin. And if anyone, upon being warned, promptly responds: “Nonsense! That does not concern me”—that demonstrates that his heart has not yet been crushed. There are several reasons why we must accurately define this distinction between Law and Gospel and strictly adhere to it. (1) There are many instances from Church history that show that the pure teaching of the article of justification has not been preserved. In fact, the article of justification cannot be preserved at all if people neglect to distinguish between these two doctrines. Woe to those who inject poison into the doctrine of justification, polluting the well that God has dug for man’s salvation! Whoever takes this doctrine away from people robs them of everything, for that person would be ripping out of Christianity its very heart, which ceases to beat after this attack. This in turn kicks away the ladder reaching to heaven, which destroys any hope of salvation. Gerhard continues: “(2) The blessings of Christ are considerably hidden when the doctrine of the Gospel is not separated from the Law by definite boundary lines.” By mingling Law and Gospel, we hide the blessings of Christ and rob Christ of all His honor. In this way we attribute to humans some role toward their own salvation and thus strip away Christ completely. God created us without our cooperation, and in the same way He wants to save us—without our cooperation. We should thank Him for creating us with a hope of life everlasting. In the same way, He alone wants to save us. Woe to anyone who says that we must contribute something toward our own salvation! They deprive Christ of His entire merit. For Jesus is the Savior, not an Associate Savior, such as these preachers claim they are. Jesus achieved our salvation completely. That is why we [Missouri Lutherans] are so determined in the predestination controversy, for the main point in this controversy is that we insist on keeping Law and Gospel separate, while our opponents keep on mingling these two doctrines with each other. When they hear us say, “Out of pure mercy, God has elected us to the praise of His grace,” or “God wants for Himself the exclusive glory of saving us,” etc., they say: “That is a horrible doctrine! If that were true, God would be partial. No,” they say, “He must have seen something in certain people that prompted Him to elect this or that particular person. And when He sees something good in a person, He elects him.” If that were so, man would really be the principal cause of his salvation. In that case a person could say, “Thank God, I have done my share toward salvation.” However, when we arrive in our heavenly home, this is what we will really say: “If it had been up to me, I would never have found salvation; and even supposing I had found it by myself, I would have lost it again. You, [O God,] came and drew me to Your Word—partly by tribulation, partly by anguish of heart, partly by sickness, etc. All these things You used as means to bring me into heaven, even though I was always striving for hell.” When we are over on the other side, we will see—and marvel—that, in reality, there was not a single hour when God did not work in us to save us, yet there was also not a single hour when we wanted to be saved. Indeed, we are forced to say to God, “You alone have redeemed me; You alone sanctify me.” Truly, as sure as there is a living God in heaven, I can contribute nothing toward my salvation. That is the point we are discussing in this controversy. Gerhard finally says: “(3) Mingling Law and Gospel can only confuse consciences, because if the gracious promises of the Gospel are falsified, there is no true, reliable, and abiding comfort for consciences that are alarmed and terrified.” Mingling Law and Gospel makes consciences uneasy. No matter how comforting the preaching is that people hear, it is of no help to them if there is a sting to it. The honey of the Gospel may taste good at first, but if the sting of the Law is part of the equation, everything is spoiled. Your conscience cannot come to rest if you are not able to say, “According to His grace, God will receive me.” If the preacher says to you, “Come, everything is now ready—provided you do this and this and this,” you are lost. For in that case you would have to ask yourself, “Have I done everything God desires?” and you will find no help. From Law and Gospel: How to Read and Apply the Bible, pages 42–47 © 2010 Concordia Publishing House. All rights reserved. To order Law and Gospel, please contact CPH at 800-325-3040 or visit www.cph.org.